Intacs are a tiny, clear, semi-circle inserts that Dr. Brian will place in peripheral layer of the cornea to help reshape the steep area of the cornea. This procedure is quick, painless and performed in the comfort of Dr. Brian’s office procedure room. In 2003, Intacs was given a FDA-approved designation for the treatment of Keratoconus thanks in part to Dr. Brian’s work. There is help for you to improve your vision and end the anxiety and suffering. 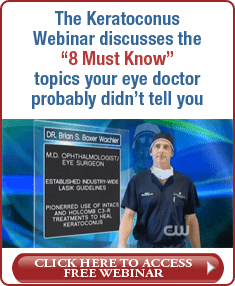 Once you learn about keratoconus causes with Keratoconus specialist Dr. Brian Boxer Wachler. 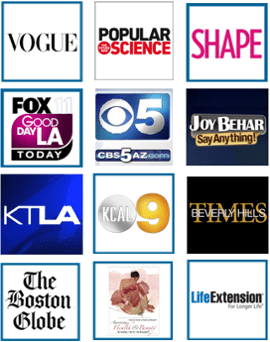 You can then explore the various treatment options. Including Intacs and collagen cross linking. To achieve maximum impact on Keratoconus and improvement in your vision. Dr. Brian typically combines Intacs with the Holcomb C3-R® Crosslinking System (two techniques for Keratoconus that he invented). 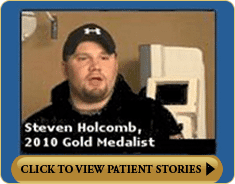 Since, most patients have both procedures performed which are typically done on the same day. Furthermore, Dr. Brian pioneered Intacs for Keratoconus and was the first surgeon in the world (except for France) to do this procedure for Keratoconus in 1999. He invented the technique of dissolvable tissue glue instead of stitches for the procedure. So no sutures used with Intacs by Dr. Brian. In addition, he has the longest experience in the world with Intacs. He’ll typically perform more Intacs procedures in a single week than a number of surgeons will perform in a whole year. Seems like, we have 25-30 out-of-town patients fly in for Dr. Brian to treat them each month. 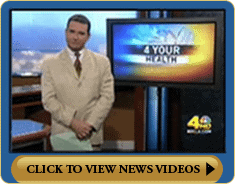 Dr. Brian’s technique and his large research study were used by the FDA as part of their approval. The FDA adopted part of his procedure guidelines for the approved Intacs® technique which is the basis for instructional courses used to train other surgeons around the world. Intacs® reshape the curvature of the cornea from within to flatter part of the bulge. Because no tissue is removed. Natural optics are enhanced without detracting from the structural integrity of the cornea. As a result, a curved glide creates a channel in the periphery of the cornea by gently separating the tissue layers. One or two tiny plastic segments. (Intacs®) are placed in the channel much like placing a pencil in between the pages of a book. Because, this causes the cornea to flatten which helps you achieve more clear vision. Using the L-U® ophthalmic tool (which Dr. Brian invented) to measure corneal irregularly, we found that Intacs® improve the irregular corneal shape. This typically translates into improved vision with less distortions, glare, and streaking of lights and these improvements can help your night vision too. Since, individual results may vary. Intacs® can be exchanged or removed if needed, but that is quite rare in Dr. Brian’s expert hands. 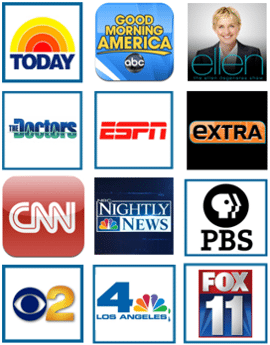 Most of all, not everyone with keratoconus will be a candidate for the Intacs® procedure. An eye doctor experienced with Intacs® can determine if you are a candidate. Hence, Dr. Brian frequently evaluates patients for this purpose. Dr. Brian has the longest experience in the world performing Intacs® for Keratoconus – longer than all other eye surgeons. Most noteworthy, patients fly from all over the U.S, Canada, and other countries. Because, they want “The Keratoconus Guru” to treat them, and won’t settle for anything less. Because, your eyes are very precious. If another eye surgeon has offered to perform Intacs® on you, you probably may want to ask about experience and does the surgeon know how to plan the Intacs® surgery. And finally, does your surgeon have to send your information to outside consultant to be told how to do the Intacs® procedure? Specifically ask your surgeon (1) if 1 or 2 segments will be used? (2) what thickness will be used? And (3) what location will Intacs® be placed? So you will have an idea about level of experience with answers to those questions. Especially relevant if your surgeon needs to send your information to an outside consultant for advice. Watch Dr. Brian’s TEDX Talk on how he pioneered Holcomb C3-R and fought for patients with Keratoconus. Most of all, does your surgeon perform the Holcomb C3-R® Crosslinking System COMBINED with Intacs® to achieve maximum Keratoconus reversal? 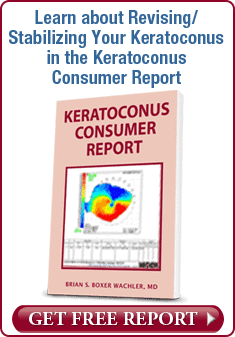 (Intacs® without Holcomb C3-R® only addresses 50% of the Keratoconus problem.) Hence, these are important questions to ask yourself since you only have one pair of eyes. And, with Keratoconus, the disease needs to be halted and vision improved in the BEST possible manner. Your cornea is somewhat like a tub of butter (soft and moldable) – this is the ideal time for Dr. Brian to place Intacs® to reshape the cornea and flatten the cone. THEN immediately afterwards Holcomb C3-R® helps to make the cornea more firm like solid stick of butter (firm, less moldable). This is the reason it is best to combine BOTH procedure on the SAME DAY rather than coming back later for Intacs®. Intacs® after Holcomb C3-R® is like trying to flatten a stick of butter. And, it is less effective than trying to mold a tub of butter. Most noteworthy, the expertise that is required for planning and performing Intacs® for successful results is as complex and intricate as performing successful brain surgery or fixing a problem in a rocket engine. Therefore, it takes years and years of experience and performing thousands of cases to truly master Intacs® and certainty not just a few surgeries a month. In addition, there is no substitute for experience in brain surgery, rocket engine repairs, and Intacs®. Dr. Brian walks you through the procedure and his voice is like a “valium,” keeping your relaxed through the procedure. Our youngest Intacs® patient is 9 years old – if a 9 year old can sail through the typically easy, 7-minute, painless procedure – so can you. Dr. Brian fixes surgery of other doctors who attempted to do Intacs® or other Keratoconus treatments because their patients’ vision worsened after treatments. Dr. Brian is like a “salvage diver” – he knows how to investigate and knows how fix the problem to unlock your vision potential. Because he pioneered Intacs® for Keratoconus in 1999 AND because he has performed many thousands of these procedures. Dr. Brian uses his proprietary Intacs® technique which is customized for EACH EYE of EACH PATIENT. 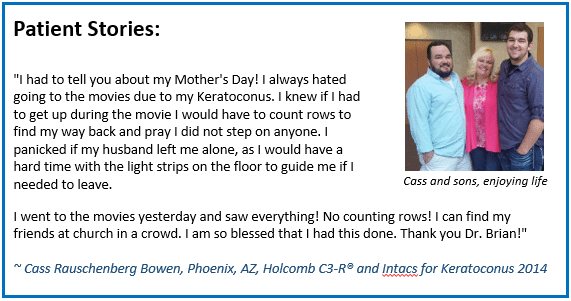 As the pioneer of Intacs® for Keratoconus and “the doctor’s doctor,” Dr. Brian has been doing Intacs® for Keratoconus over 17 years, which is longer than any other eye surgeon in the world. Especially relevant, if you live out-of-town. Dr. Brian can review your chart notes ahead of time to make a preliminary determination as to whether Intacs® may be beneficial. Listen to Norris’ experience 3 years after treatment. Listen to Dr. Howard’s story of Keratoconus. Listen to how Intacs® changed 23-year old Travis’ life. Rather, why choose Dr. Brian for your Intacs®? Listen to Julie’s story about how having Intacs® performed by a less experienced doctor led her to Dr. Brian because the improperly placed Intacs® worsened her vision. Dr. Brian was the first surgeon in the U.S. to perform Intacs® for Keratoconus, now over 17 years ago. For over 17 years, Dr. Brian has been performing Intacs® procedures many times per week, which is more than a number of surgeons perform in a year. While, you can feel confident with him. Would you really trust your eyes to someone who only does one Intacs® procedure a month or just a couple times a year? As a result, some patients take a “wait and see” approach with Keratoconus. The risk of waiting is that as the cornea continues to bulge out and get worse. The back layer of the cornea can rip open. Like someone wearing way too tight pants who sits down and the pants split wide open down the middle seam. Finally, when this happens to the progressively bulging cornea. Therefore, the internal eye liquid rushes in and swells up the cornea the same way a dry sponge soaks up water and becomes very thick. In addition, these photos below show a cornea swollen up like a soppy, wet sponge after it split open. If this happens to you, it will take 3-6 months of non-usable vision until this fluid goes away. When it eventually does. Seems like, the cornea will have a lot of new scarring and vision will be permanently worse compared to before it ripped open. Consequently, the good news is that this devastating damage can easily be prevented with the 30-minute, non-invasive, 1-day recovery Holcomb C3-R® – it will give you important peace-of-mind. 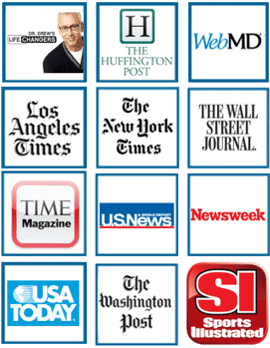 Most noteworthy, many out-of-town patients would like Dr. Brian to do a complimentary review of their medical records. And, make a preliminary determination of candidacy. Because, this is useful before planning a trip to Beverly Hills. Along with your last 2 or 3 eye exams. Also, please be sure to include a color copy of your corneal mapping. Color corneal mapping is a very important tool. Along with your exam history, to determine your candidacy. The last 2 years of your total eye history will be used to make this preliminary determination. Inside the envelope. Please be sure to include a cover sheet with your name address, phone number and email address and the words, “Keratoconus Record Review”. So that we may optimize communication with you. And finally, enclose with your letter and copy of your records. Finally, you can scan your records and email them to info@boxerwachler.com.